180mm faced Hanger with 30-degree Baseplate in stone finish. 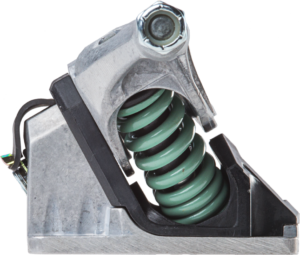 For optimal traction, power, and control, we usually suggest a 30-degree truck at the tail and a 45-degree truck at the nose, with stiffer springs at the tail than at the nose. Use two 45-degree trucks on symmetrical (twin-tip) freeride decks. Use stiffer springs if you’re heavier and/or taller than average, softer springs if you’re lighter and/or less tall. I’ll keep this brief. Seismic trucks are fantastic. I run them on my dedicating carving setup on a 25in WB. Obviously, the 30* is my rear truck. I did take it off briefly, to try running it with a front Bennett Vector on my LDP setup. The problem I have with it is now I have to buy another 30* to add to that setup so that I can run my “test” truck with the carver setup as intended. They feel intuitive. The even feedback across an entire turn, from start to finish, is incredible. The customer service is second-to-none. Don’t be afraid to ask a question. You’ll get a response back in lightning time. Dan is extremely helpful and knowledgeable. I can’t say enough good things about Seismic trucks. I don’t leave home without my board. I could not agree more- these trucks rule. As an Old school skater still shreddin the gnarl, I ‘ve skated on all kinds of trucks- but these are AMAZEBalls! I plan to by a set of 30’ degree for my park board or to apply to my downhill and cruiser setup when I start doing faster, steeper runs.